We have a brand new hide; it is bigger and better than the previous one. The positioning is perfect, built on the western bank of our waterhole and it will be interesting to see how the sightings are affected. 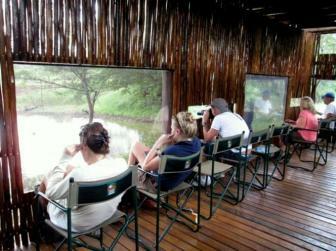 In light of this I thought it would be nice to reflect on some of our interesting moments at our hide. From two black rhino kicking up a dust storm fighting for territory, to a herd of elephants coming within a meter of the hide’s window. A leopard was seen sneaking through the drainage line in its quest for a drink of water but the wild dog pack that was sleeping there quickly chased it out of the area. Large buffalo herds cooling down in the water are a regular sighting. A group of male lions enjoy sleeping on the dam wall and the new hide is in an excellent spot for photographing them. We previously had limited space for photographers but we now boast more than enough room for everyone’s camera, we have also added another window to the side of the hide so that game approaching through the drainage line can be easily viewed. With a constant stream of plains game coming to and from the water we are sure that our new hide will provide for some exciting safaris, we can’t wait for everybody to come see it for themselves.